Book Summary: PSYCH WAR PART 2! Trapped in the mind of the White Queen! Will Jean be able to escape? And will she be ready in time for the Phoenix? Book Review: "Imagine that. All it took was a little death and desperation to turn you into me." This issue completely picks up where the last issue has left off. Young Jean is in terrible shape after the war caused by older Jean and Emma. She is rushed to the hospital but there doesn't seem to be anything that any of the staff can do to keep the psy-flames from continuous appearing. This sends Older Jean to try to go back into young Jean's body but something rejects from entering her body. Emma gets the idea of taking young Jean out of the hospital after that display and hijacks a life saving helicopter. They load the unconscious young Jean into it and head away from the hospital. In another part of the world, Hope has been told of a cosmic detention on Earth. The young woman knows exactly what is here and heads off in the direction. As we return to Emma and Older Jean, it appears that young Jean may have stablized but Emma's curiosity about the tiny spark that Emma believes Older Jean found. Older Jean tells her that it was actually younger Jean who found it. Older Jean continues to feel guilty for her part in all of this but inquires why would Emma continue to hold onto it. Of course, Emma reveled in the power that the Phoenix Force gave her and she wanted to keep it for herself. "It's Here," young Jean announced. The Phoenix Force hovers above them. Now with the arrival of the Phoenix Force, does this mean this will be the issue that will awaken the older Jean from her grave. We have been teased by this and it is set for this upcoming month of her arrival. So I can only surmise the arrival of the Phoenix Force in this issue is the arc to the rebirth of older Jean Grey. But if this is how it will be, then what is going to happen to young Jean in the scheme of this? I mean this may not entirely lead up to older Jean's rebirth and I could be entirely jumping the gun here. So if it is not for the awakening of Older Jean, what does this mean for the younger Jean? And now that the arrival of the Phoenix has come, exactly how is younger Jean going to avoid the fate of becoming its host? I suppose we won't find out any of these answers until the next issue. So stay tuned! Book Summary: Desperate to find any information that will help her stave off possession by the Phoenix, Jean Grey ventures to Atlantis to entreat its surliest former host: NAMOR, THE SUB-MARINER! But Namor has his own fish to fry…And when Jean is swept up in the Sea King's madness, will she find herself in over her head? 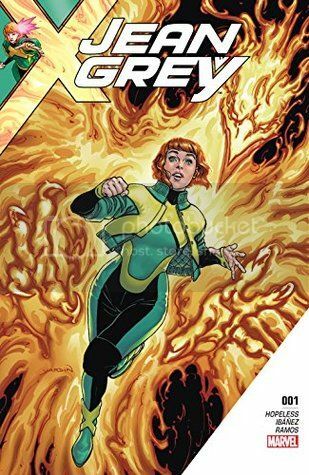 Book Review: Teenage Jean Grey does not want to be swallowed up by the Phoenix force like her previous counterpart that she sets out to seek out advice, train, and find a way that will stop the inevitable from happening. In this issue, we find her in the underwater realm belonging to Namor. Namor had once tangled with the Phoenix Force and come out of it unscathed but did Namor really come out of it in such a way? The way we see Namor's expression in this issue tells me that the Phoenix Force did more than scar him in a way that it has not yet been explored yet. I can only fathom that Namor wishes at the moment to leave that part of his life in the past and never really have to deal with the consequences that he is still reeling from. Namor ends this issue with a food-for-thought to Jean. What if she could take down the Phoenix force with her bare hands? I know many people are not fans of Namor but I thought he did really well in this issue. After all, he has tangled with the Phoenix Force in the past but how scarred is he deep inside from his encounter with it? This issue did not explore it but we can see that he is still reeling from it....that it has affected him in ways that we do not know of. I do like the idea of Jean teaming up with others and becoming stronger than she was in the beginning. I think she is growing as a character but I believe she is trying a wee too hard to escape the Phoenix Force. This could eventually lead to her own downfall because the Phoenix Force can eventually use this against her. Overall, I am looking forward to seeing how this story plays out and the inevitable clash between Jean and the Phoenix Force. Book Summary: TELEPATHS UNITE! The Phoenix is coming! 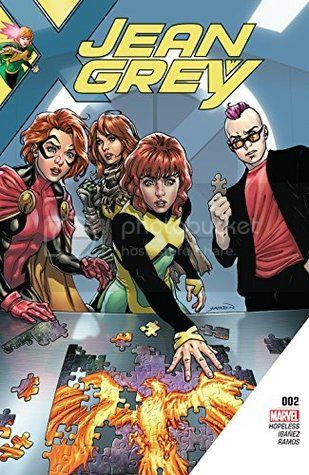 And determined not to become its next victim, JEAN GREY will enlist the help of its previous hosts…but will RACHEL GREY, QUENTIN QUIRE and HOPE SUMMERS have the answers she's searching for? Book Review: Although Beast tries to assure Jean that the Phoenix is no where near in sight, but Jean believes otherwise and decides her best course in finding the Phoenix is to use Cerebro. As she finds herself in communication with Colossus and the others, she locates Hope, who is undoubtly in trouble. Jean heads out to her rescue and so do the others. I am a bit disappointed in Jean in this one. She acts more like a brat than a leader. I understand her concerns when it comes to the Phoenix entity. After all, her older self was consumed by the entity and has died multiple times. Still instead of focusing on the inevitable, she should focus on becoming stronger. Perhaps if she does become a bit more stronger her fight against the Phoenix may just work in her favor. This is just the second issue and I am not saying it is bad. The character just has her moments. I am looking forward to seeing how this plays out and seeing the showdown between Jean and the Phoenix. Book Summary: When a teenage JEAN GREY traveled through time and arrived in the present, she learned the terrible fate that befell her predecessor: Possessed by a cosmic entity called the Phoenix, Jean was trapped in an endless cycle of life and death. Determined to escape that future, Jean set out to write her own destiny. But now, she's visited by a premonition that the Phoenix is coming for her…and in this new ongoing series by DENNIS HOPELESS (ALL-NEW X-MEN, SPIDER-WOMAN, X-MEN: SEASON ONE) and VICTOR IBANEZ (EXTRAORDINARY X-MEN, STORM), she's going to fight tooth and nail to escape becoming its next victim! This is not the Jean Grey you know. This is not the Jean Grey whom was consumed by the Phoenix and died time and time again. This Jean Grey does not want to become that Jean Grey and she is going to do everything possible to change her entire destiny but she is having these promonitions that that the Phoenix is coming for her and that there may not be any escape from it. I haven't picked up X-Men comics in over twenty years and I thought I would return to the X-Men universe with this issue. This issue introduced me to another Jean Grey. Since I haven't followed the X-Universe in a long time, I am a bit confused as to why this Jean Grey was ripped from her world and brought to this one but I suppose as the issue progresses I will find out. Still this issue has promise as Jean Grey navigates through this new world as she tries to change her life so that she will not share the same fate as the other Jean Grey. I am quite looking forward to seeing how this story pans out and to see if Jean and can even keep the Phoenix force at bay.